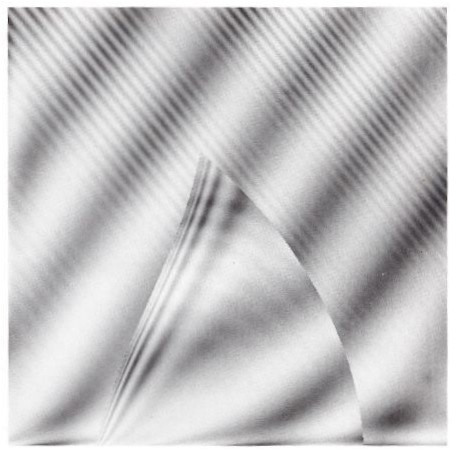 I was drawn into computer art as a spin-off from experiments in visual perception, which required the production of complex visual stimuli by both analog components and digital computers. This led me to attempt to express some of my amazement at the nervous system in giving rise to the subtleties of perception. The electronic systems that we call computers seemed an interesting way to go about it, and in doing so I discovered a number of viewpoints about the role of computers. The computer system serves a multiple role as canvas and environment, as tool and creator. The 'canvas' is the range of output devices, from line printer to microfilm plotter, from oscilloscope screen to the control of laser beams. 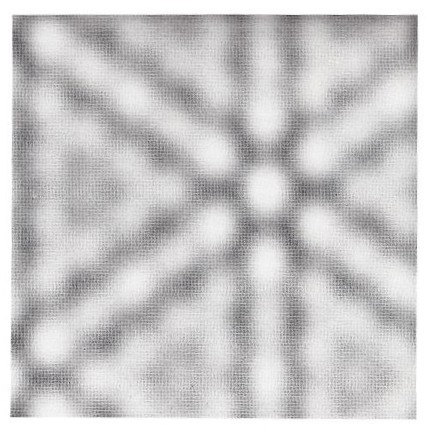 A new medium to work on, with its limitations and idiosyncrasies, has often served to send art on a different tack in the past; so the canvas of computer peripherals might be sufficient to do so again. But computers have vastly more to offer than that. One of the trends of recent art has been the tendency to operate by selecting from an environment entities that have significance to the artist rather than creating from scratch on a tabula rasa. This approach can be traced back to the Zen potters of China who allowed the glazes to form patterns in the heat of the kiln and then choose particularly fine examples of the result. The same type of selection with minimal control over the medium is the basis for much of photography (but less so in film-making), dadaist art, kinetic art and other approaches, and is I think typical of the use of complex technology. The instruments which are thought of as tools at the disposal of the artist become part of the environment in which the art is produced. The artist selects the output by 'cybernetic serendipity.' The constraints which would be considered limitations in the case of a simple tool such as a brush become a source of inspiration and subject matter in the case of a complex tool like a computer. Although one is accustomed to thinking that anything is possible on a computer, in practice the hardware making up the system, the available programs and cost limitations add up to an adaptive environment which can serve the artist as a continual source of ideas. The computer can itself act as the creator by the ability to generate random (or pseudorandom) sequences of numbers. On a low level this can operate merely to produce the arrangement of patterns or the selection of elements for a design, and many computer artists have utilized this process to great effect. But in principle the random process can be used in the generation of the program itself; a metarandom organization of the generative process. In practice this is likely to lead to many programs which are inexecutable on a given computer system, but an analogous process operates in human creativity. Many false starts and abortive attempts may be made before a workable design is produced. This brings us to a new definition of computer art—art produced by the computer which is essentially out of the control of its operator. The entirely unexpected results of concatenations of program elements, intended to serve other mundane purposes. 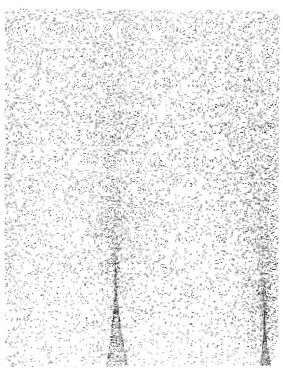 One of the finest graph plots I have come across was generated by an automatic drafting machine which inexplicably developed a fault and went on to produce a string figure of unusual beauty. Rerunning the program failed to reproduce the fault, which was an evanescent excursion into the realm of autogenic computer art. 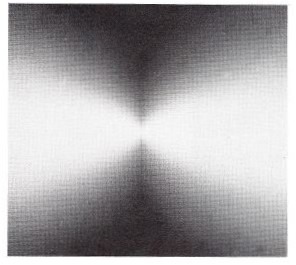 Another example of computer generation is the Kaleidoscope program by DEC, which uses random inputs by the observer to build up the program controlling a dynamic display. Rather than the display being controlled by the user, the program is accreted under user initiation to produce a unique organization on each run. When this kind of activity is produced with sufficient flexibility, it can truly be called computer art. The present inspiration for my work comes from the sinusoid—that mathematical wiggle which can transcend the operations of addition, subtraction, multiplication, division, integration and differentiation, and emerge unscathed. It is mathematically the simplest form of oscillation, and as such represents the whole domain of periodic events that mean so much in the process of life. The waves, the tides, the diurnal and seasonal variations. Light waves, sound waves, radiations and vibrations. Rotation and periodic cycles, repetitions and echoes, oscillations and pulsations, palpitations and ululations—all flow into the image I wish to produce. 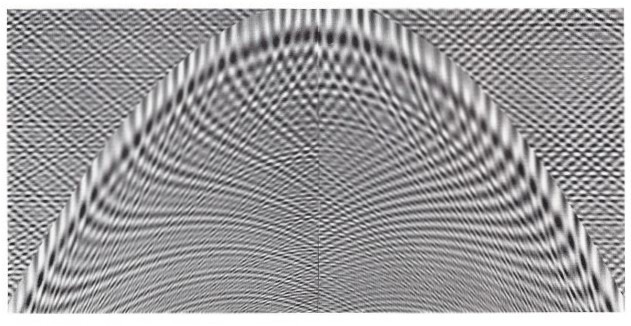 In the study of human visual perception this mathematical tool has recently been introduced in the form of the sinusoidal (or blurred) grating. It is particularly useful for investigating the basis of visual responses to the environment because of its repetitive or multiple nature, which mirrors the repetitive or parallel organization of the neural pathways. 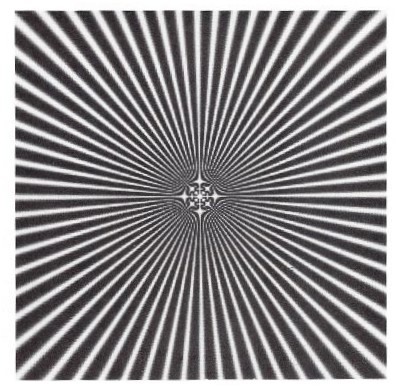 This means that sinusoidal gratings are especially potent in producing visual illusions and distortions, because they can swamp the whole retina with the same kind of stimulation. 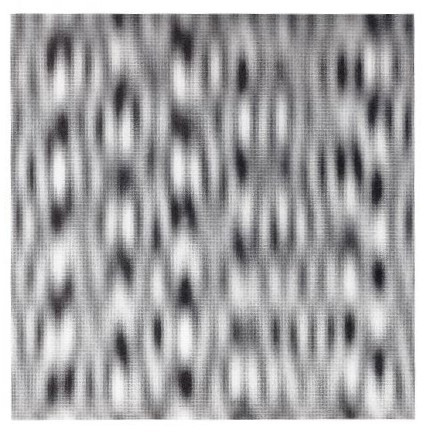 Gazing steadily at images made up of these gratings will produce fluctuating, shifting impressions due to adaptation at several levels of the visual system. The very regularity of the pattern is the cause of its shimmering vitality in the brain of the perceiver. I am particularly interested at this stage in avoiding the hard-edge, line-dominated form that typifies computer art at present. The microfilm plotter, which I have used mainly, allows continuous gradations in grey-level and opens wide possibilities for detailed control of the resulting image. In the Morphonome series I controlled the form of the image by a specific equation (hence the name) usually with a clear image in mind. But the Autonome series was produced with many functions under (random) control by the computer. I subsequently selected results that appealed to the human nervous system. The work represented here was all produced at Northeastern University on a CDC 6600 with a Calcomp plotter, or at Bell Laboratories on a Honeywell 6000 and a microfilm plotter.